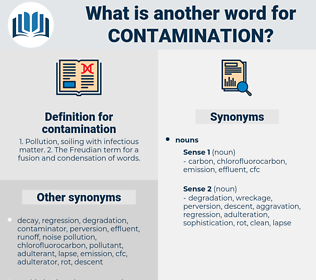 What is another word for contamination? 1. Pollution, soiling with infectious matter. 2. The Freudian term for a fusion and condensation of words. transmission, dirt, infestation, degradation, grime, Fouling, polluter, emission, exposure, impurity. 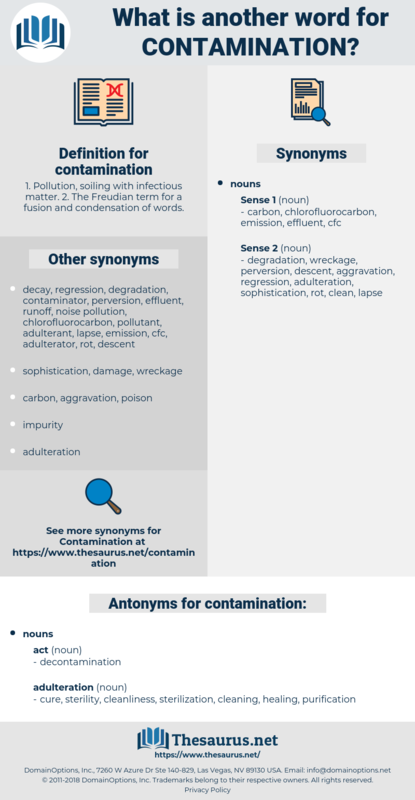 contagion, contaminating, poisoning, contaminant, contaminated, radiation, remediation. cure, sterility, cleanliness, sterilization, cleaning, healing, purification. purity, Clarifier, purifier, filter, immaculateness, refiner. It is not to do good unto others, but to escape contamination from others which is the concern of the Hindu devotee. Just imagine what human blood will be like in coming generations if this artificial contamination with all sorts of disease taints and drug poisons is to be forced upon the people!